I rarely go to Makati. As someone who works in Caloocan near Quezon City, the anticipated traffic of traveling from north to south can make one cringe with discomfort! Furthermore, it doesn’t help that I actually live in Antipolo City. So you can imagine additional hours in the car when going to and from Makati. Nonetheless, my fiancé Jacob had a shoot in Makati last Tuesday. I promised him I’d be present to provide physical moral support for his first actual endorsement since winning Mr. Chinatown 2017; so I found myself in the country’s busy, bustling financial hub. 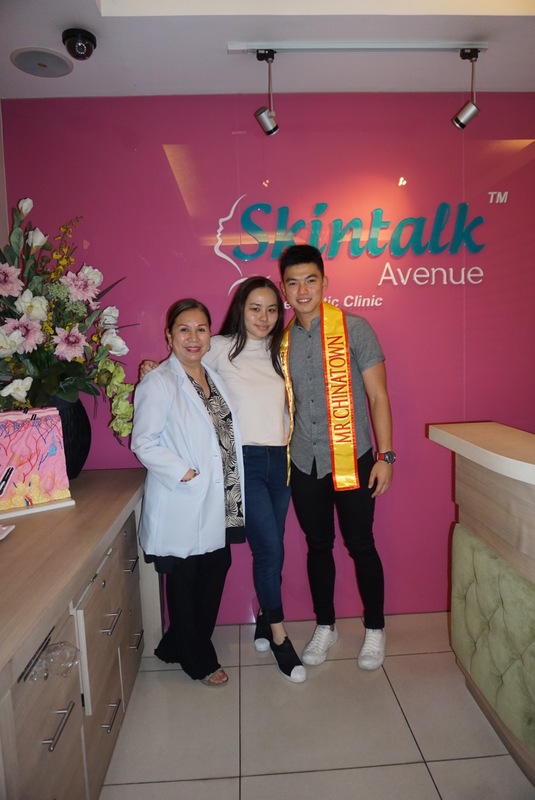 I met Ms. Leah Agbayani, the owner of Skintalk, at one of Mr. & Ms. Chinatown 2017’s pocket events last month. During our brief conversation, she told me she was in her mid-50’s. The revelation took me by surprise! Primarily because of the freshness of her skin, and the absence of wrinkles on her face! Tita Leah literally has no pores! She looked as though she had only turned forty, far from her actual age! She mentioned that she actually ran her own aesthetics clinic, which she relies on to maintain her youthful glow! I told her if ever I am in Makati that I’d hit her up to check out her clinic. And there I was! Upon arriving at Skintalk, Jacob and I were immediately welcomed by Tita Leah’s friendly staff. I had asked Jacob to accompany me in exchange for spending the whole afternoon at his thematic shoot. We were presented with their brochure of services, which we had a difficult time choosing over because everything seemed so appealing. However, we ended up pushing through with the Skintalk Signature Facial. You know what they say, when in doubt, go for the bestseller! It took the staff about five minutes to set up the room and machines before we were called in to begin the treatment. My personal description would be that the Signature Facial has seven parts. The first being the facial cleansing procedure; then there is the scraping treatment; the black head and white head removal; pore closing laser; vitamin C massage; collagen mask placement; and finally skin cooling therapy. Yes, all seven parts in one Signature Facial! 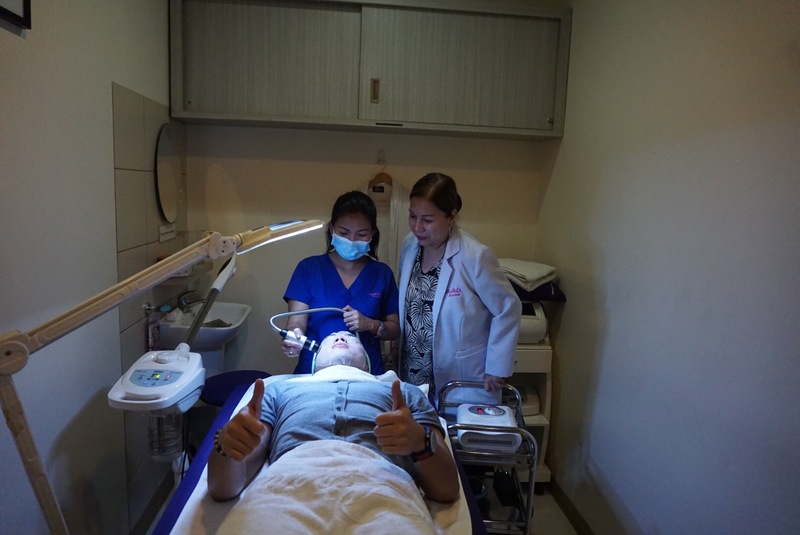 Facial Cleansing Procedure – After being asked to lie down on their treatment bed, the staff assisting me, Dayna, rinsed my face by massaging their special Skintalk facial cleanser. Dayna then sprayed toner on my face, which she spread gently across my skin using a cotton pad. Scraping Treatment – According to Tita Leah, scrubbing to exfoliate is not the healthiest way to get rid of dirt and dead skin cells. At Skintalk, they use the scraping method, which involves the use of a steril blade – only to be used by professionals, of course. Dayna stated that the only downside to dermaplaning – a term associated to the facial scraping treatment – is that it removes hair follicles along with all the grime it scrapes off. Scraping also helps speed up cell renewal rate, so skin should look healthier within the next few days! Blackhead and Whitehead Removal – Dayna covered my eyes and put my face through a hot steaming treatment for a good five to ten minutes before proceeding to remove my blackheads and whiteheads. Heat opens up the pores, which enables Dayna to access and relieve my whiteheads more accurately and effectively. Most of my whiteheads were on my nose. I can’t say the procedure was painless, but Dayna definitely did her best to make the experience tolerable! Pore Closing Laser – The laser is not heated, but I could feel its high frequency as Dayna rolled the laser across parts of my face. She hovered the laser over areas where my pores were visibly larger, as well as over my nose which she touched on the most for the whitehead removal. The laser also prevents infection of open pores. Vitamin C Spray – The spray contains antioxidants that protects and replenishes the glow in the skin. Collagen Mask – The collagen mask they placed on my face was ice cold, but doesn’t sting. Skin Cooling Therapy – With the collagen mask still on, Dayna implemented a skin cooling mechanism through a tool that she repeatedly massaged and pressed over my face. It was so comfortable I almost fell asleep! Tita Leah says for DIY cooling, they used to rub ice cubes over the face to close pores for smooth, fresh skin! Their skin cooling therapy basically achieves the same result but in a more soothing manner. To end the Signature Facial, Dayna removed the collagen mask, wiped off excess collagen using a soft face towel, then applied antioxidant moisturizer on my face. I honestly felt rejuvenated, and appreciated one of my favorite facial experiences so far! Did I mention that Tita Leah only charges Php 1,500 for this popular service? Skintalk even has a special promotion ongoing that offers a choice of Diamond Peeling or Cavilipo on Face (Php 2,500) for free when you avail the Signature Facial! Their Diamond Peel, also known as Crystal Peel is a form of microdermabrasion treatment with no downtime. The service stimulates collagen production as it takes away dead skin cells. They propose the Diamond Peel to address fine lines, acne scars, and pigmentation. The Cavilipo is a non surgical and non invasive treatment that makes use of sound waves and diode laser to melt and break down fat cells. Cavilipo on the face entails pressing the laser on the areas of the face where fat is prevalent. It can also be used for other parts of the body, like arms and thighs. The promo is valid only for a specific period of time, which I was unfortunately unable to confirm to report here. Skintalk Avenue Aesthetics Clinic is located at 107 BUMA Building, 9595 Kamagong Street, Brgy. San Antonio Village, Makati City. It is open Mondays to Saturdays from 11am to 7pm. You can set an appointment by calling their telephone numbers, +632-478-3009 or +632-347-2606! Jacob and I enjoyed our first ever Signature Facial at Skintalk. We’d be willing to take another trip to Makati just for it, as well as attempt to explore Tita Leah’s other offerings!